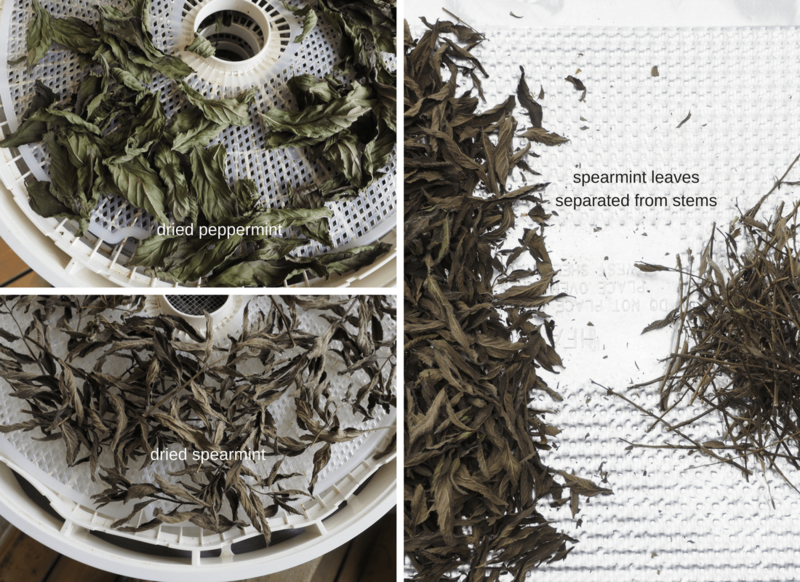 After two years of failures, I’ve finally found the secret to dehydrating mint. What’s the secret you ask? Follow the experts! The first year I dried mint I just cut the stalks, hung them up and put to dry in the sun. 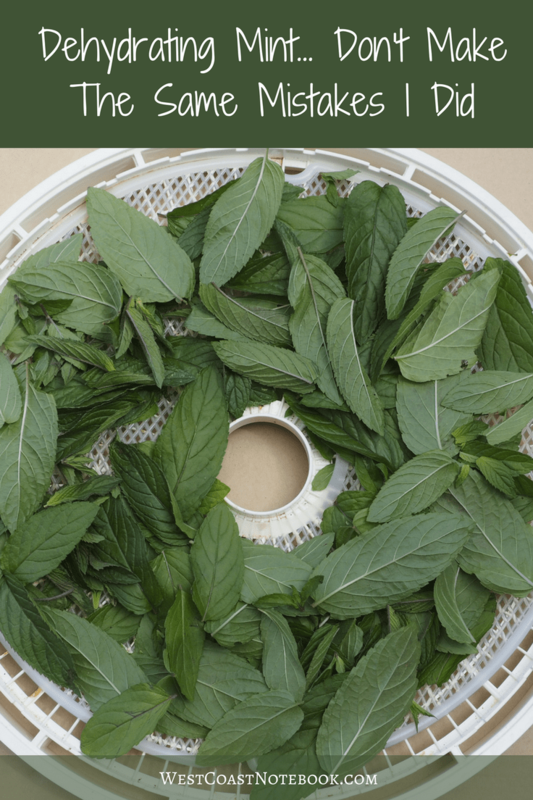 The second year, I picked the mint and put it stalks and all into the dehydrator. Each year I tried each of the batches as tea and I have to say they were disgusting. Sort of like dirty dishwater without any flavour. Of all herbs, I figured that mint had to be one of the easiest to dry. You can’t kill it. Lord knows I’ve tried. I’ve abused it, pulled it all out (at least I thought I did), left it parched with no nutrients and it still grew. I believe if you had just a rocky field or driveway that it would find a way to survive. So why wasn’t I able to get some decent tea out of it? Okay… so I could use it fresh but what about on those cold winter nights after dinner, when you just want a nice herbal tea to settle the stomach and relax. After two years of trying, I figured I better go back to square one. In doing some research, the first thing I learned is that you don’t dry mint out in full sun. Sunlight destroys a herb’s essential oils and colour. In fact, it’s better to keep your herbs in a dark place even after being dried to maintain their potency. The second thing I learned was to pick the mint first thing in the morning after the dew has dried. The oils in the plant are the strongest and most concentrated at this time. I don’t know if this is true or not, but I followed it to the letter. 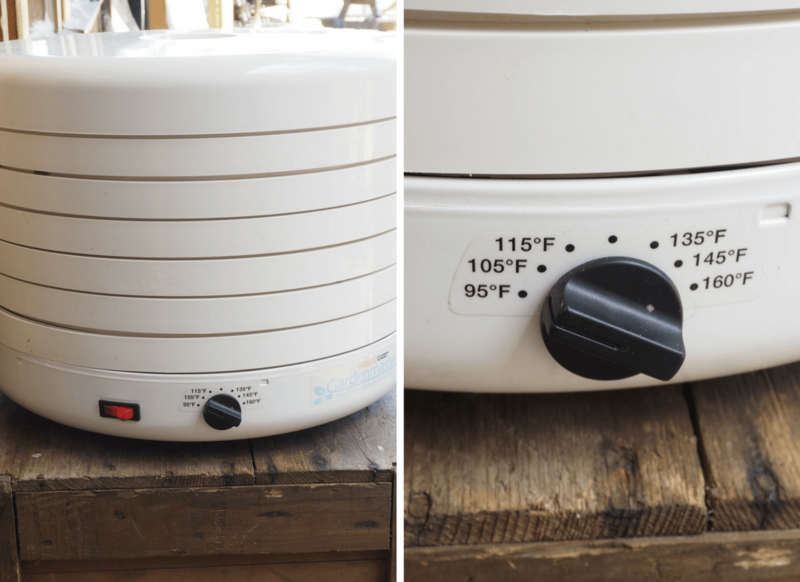 The third thing I learned was if you put the dehydrated on too high a setting, it will destroy the essential oils and basically, you will have cooked mint instead of dried mint. Been there done that! The fourth thing I learned is that you pick the mint before it flowers. Once it flowers all the energy and oils are going up in the flowers and the leaves lose their potency. And I picked the mint when it was in flower both years. Supposedly the best time to pick is just before the mint plant forms a flower bud as you will get the most flavour from the leaves at this time. So with my new found knowledge, I was so glad that I caught my mint before it flowered. This year, I had peppermint and some spearmint. They had both been placed into pots so they couldn’t spread to the rest of the garden. To start the process I picked it in the morning after the dew was off the leaves. As you can see from the picture, I trimmed the heck out of it. A lot of people say that you should only cut it down to the last two leaves at the bottom so the plants don’t go into too much shock. But as I mentioned earlier, you can’t kill it. I just leave a few bits of new growth around and within a couple of weeks, it will look like it does in the before picture. After cutting the peppermint, I took a sharp pair of scissors and cut off the leaves taking off as much of the stem as possible. And… as I wanted to try an experiment, I left some on the stems as well. The spearmint I left on the stems as the leaves are a lot smaller than the peppermint. But in both cases, I trimmed them in the garden. Taking off all the discoloured leaves and anything that looked a little iffy and ended up with a clean product that was ready to dry. At this stage a lot of people with wash it and dry it in their salad spinner, but I didn’t bother with this step. Both plants were clean and didn’t have any visible bugs on them, so I went ahead and started to process them. 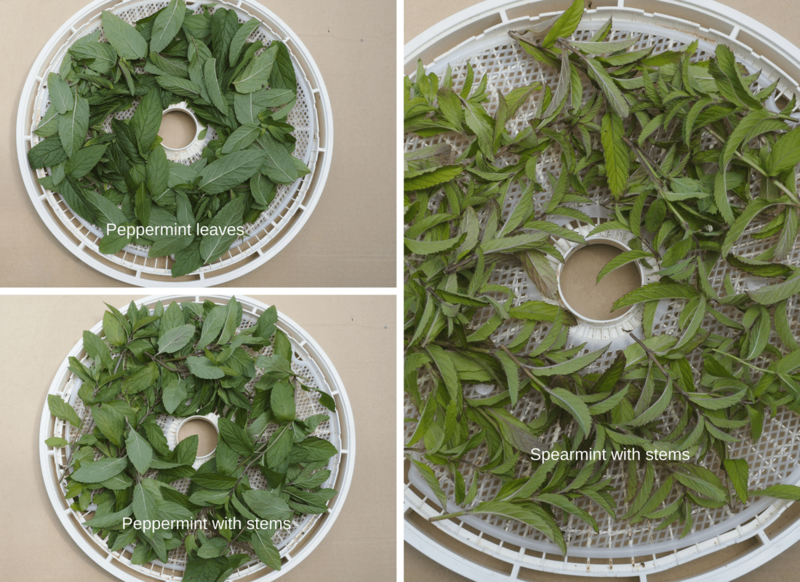 Arranging the mint as in the pictures below I proceeded to put on the dehydrator. I ended up with 6 trays from the amount of mint that was cut. 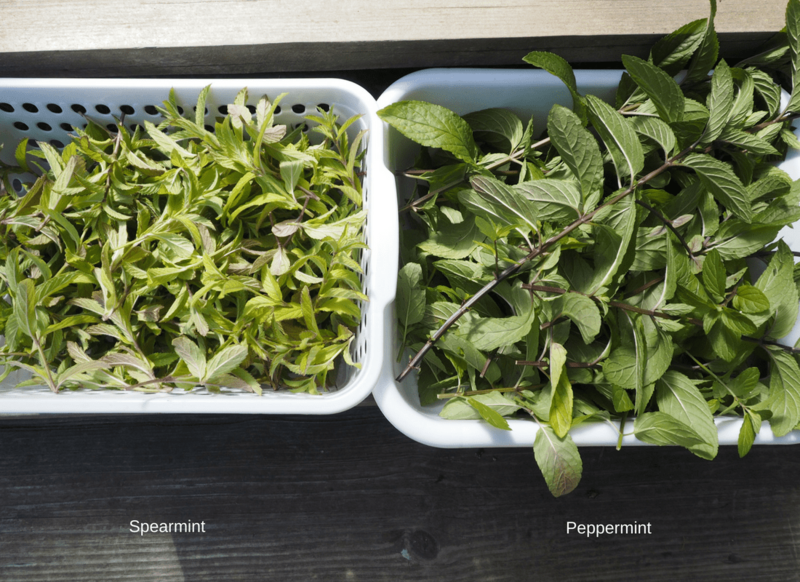 Two spearmints and three peppermint leaves and one peppermint with stems. Making sure that the dehydrator was set at the lowest level (on my dehydrator it is 95 degrees F) I started the machine. Checking them every hour to see how they were progressing, it didn’t take long for them to dehydrate. I left them for 3 hours and they were totally dry. 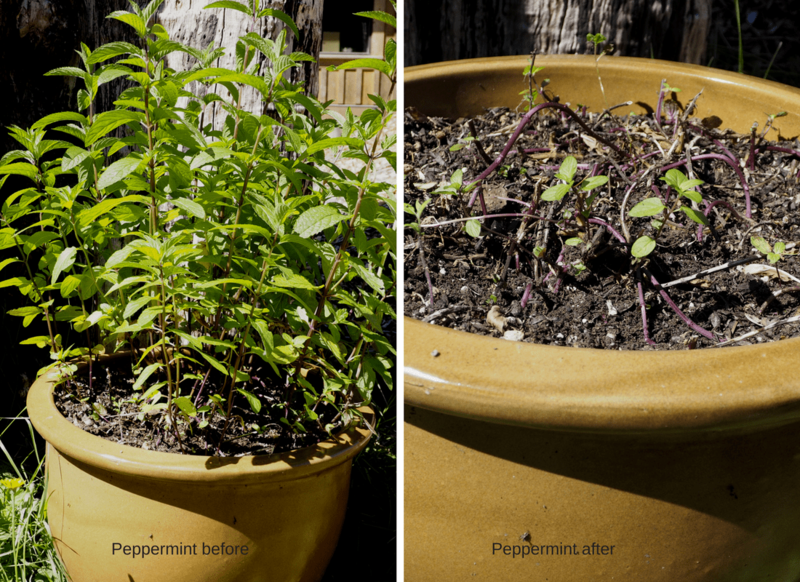 The spearmint looked a little brown, but it had quite a few brown tones in the leaves to begin with, and the peppermint came out green. Amazing. And both mints smelled delicious! The first step was to put the leaves on an aluminium cookie sheet that you can get at the dollar store. 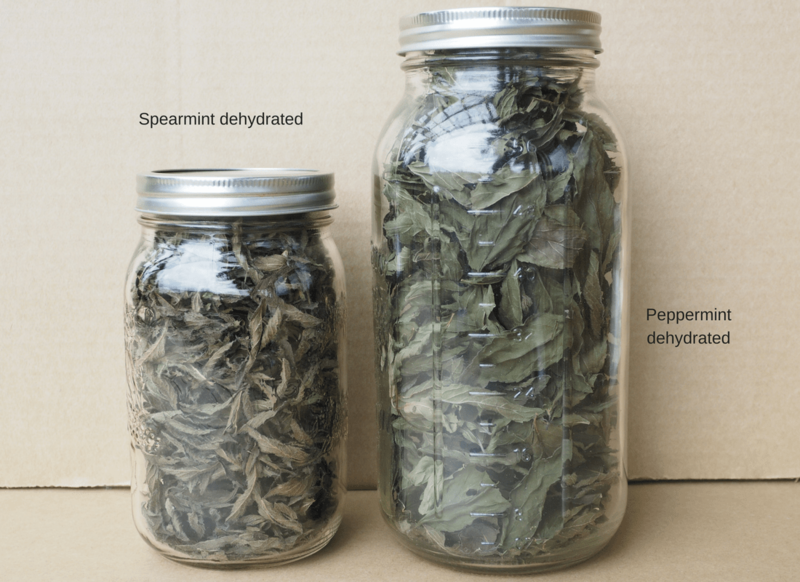 Separate the leaves just by running your hand down the stems and then place the dried leaves into jars using a funnel. Even though it was a little more work, I preferred cutting the leaves off the peppermint rather than taking them off the stem when they were dried. This kept the leaves whole and when it was taken from the stem after drying the leaves become crushed. Not that there is any difference if you are making it into a tea, but if I was going to use it to put into an iced drink it would be nice to have the full leaf. As the leaves were smaller on the spearmint, they seemed to retain their shape so this wasn’t an issue. To give it the taste test I made two cups of tea to sample and they were both aromatic and pleasing to the palate. I can now say that my mint dehydration has the sweet smell of success... In more ways that one.